Almost got my fishing maxed out. I used it a ton to get my Master of the Ways title. I almost have my archeology at max too. Next I think I’ll, um, hmm. Roll another alt, I guess? This entry was posted on Friday, February 14th, 2014 at 12:00 am and is filed under Comics. You can follow any responses to this entry through the RSS 2.0 feed. Both comments and pings are currently closed. That is the general rule for any MMORPG. 3-year long breaks . . . nonetheless, you might be right. 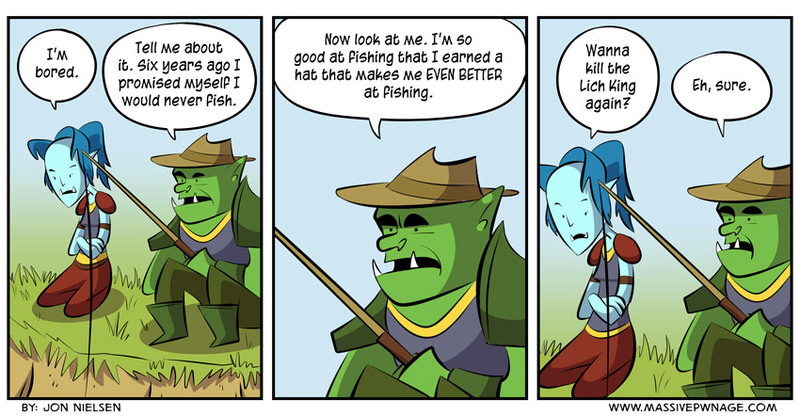 However, there are no more fishing achievements for me to earn.